A key individual who was central the success of Jade Peony's induction as part of Project Bookmark is writer Anna Ling Kaye, Literary Editor of Prism Magazine and President of the Asian Canadian Writers Workshop. 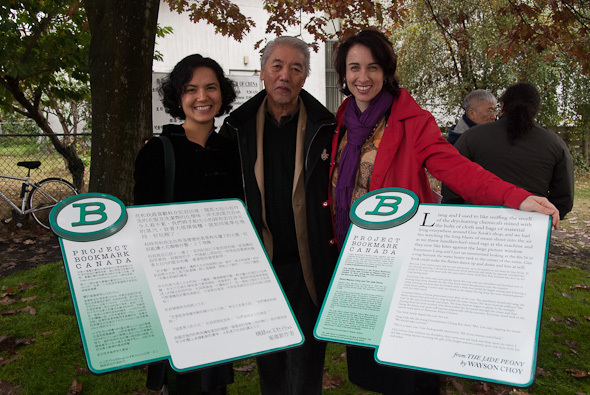 Almost as early as 2011, Anna has been working feverishly with Miranda Hill in promoting Asian Canadian passages and landmarks for inclusion of Vancouver's Project Bookmark. She was of course instrumental in assisting with finding and photographing the actual location for the bookmark and working with city officials, all the while arranging for the translation of the passage into Mandarin. After the speeches, Anna Ling Kaye read the passage in Mandarin, followed by Wayson Choy reading it in English. First published in 1995 by Douglas & McIntyre, Jade Peony offers a a glimpse of Vancouver’s Chinatown in the 1930s and 1940s. It shared the Trillium Book Award for best book in 1995 (with Margaret Atwood’s Morning in the Burned House), was the recipient of the 1996 City of Vancouver Book Award, and has sold more than 100,000 copies.